There is more information available on this subject at Red vs. Blue on the English Wikipedia. Red vs. Blue, often abbreviated as RvB, is a machinima series created by Rooster Teeth Productions. The story centers around the adventures of two teams composed of simulation soldiers. The series is primarily produced using the machinima technique of synchronizing video footage from a game to pre-recorded dialogue and other audio. Footage is mostly from the multiplayer modes of Halo: Combat Evolved and its sequels, Halo 2 and Halo 3. The series is published by Rooster Teeth Productions, originally available for download per episode at their site and later released on DVD. Praised for its originality, the series has won a total of four awards from the Academy of Machinima Arts & Sciences. Although mainly a satirical and absurdist comedy, the show often touches on deeper philosophy about the meaning of war when it comes down to individual soldiers; as well as other more serious themes such as human morals in the face of extinction and the humanity of artificial intelligence. The characters occasionally question the validity of their mission and whether or not it accomplishes anything, a common theme in commentary about the ethics of war. The Blood Gulch Chronicles begins with the introduction of two rookies on the Red and Blue teams, also getting a jeep and a tank respectively. While the Red Team leader, Sarge, was at Red Command, the Red recruit, Donut, is sent on a fool's errand by his fellow soldiers(Simmons and Grif), only to accidentally steal the enemy flag when he believed it to be the store (and the Blue rookie Caboose believing Donut to be the General foretold in the fool's errand of his own). The weeks of reconnaissance and intelligence gathering breaks down into chaos and poorly constructed offensives. Several months after the first season, a medical officer, named Dufrenes, arrives to check on the wounded soldier Blue team reported. He had come months afterward, so by the time he got there, the wounded soldier (Tex) had already died. Almost immediately after his arrival the Red team attacks. Red team salvages their failed attack by getting Doc as an exchange for Blue team's surrender (although he was ordered to go to Red team anyway). Doc's added involvement in the canyon, combined with a rampant AI infecting Caboose will force the two opposing teams to do the unthinkable. The Red and Blue armies believe to have found themselves in the future. They have stumbled upon a prophecy which says a blue being will destroy a large 'temple'. They are trying to defend from an attack from O'Malley when this 'Great Destroyer' arrives. Following a distress signal back to Blood Gulch, the Red team experiences a falling out with one of their soldiers. Tucker, Tex, Caboose, and the alien go on quest to save the alien's race. Tex does not return to Blood Gulch with the rest of Blue team, and Tucker becomes seriously ill.
Out of Mind is a mini-series that took place in-between Season 4 and Season 5. It is a narrative from Tex's point of view, told in a much more serious tone. Its events precede both Season 5 and Recovery One. A ship from Earth has crash-landed in the middle of the canyon on top of Donut, bringing a new soldier, Grif’s sister. Red team experiences a major crisis in their chain of command and Blue team welcomes a new addition to the family. Church tries to stop O'Malley once and for all. The series finale was distributed with three alternate endings; the ending which was shown to a viewer depended on which link in Burnie Burn's post they followed to watch the episode. An additional three endings were included in the special features of the Season 5 DVD. Recovery One was a Red vs. Blue miniseries distributed via Xbox LIVE and the internet that takes place after Out of Mind as well as before and during Season 5. Its plot revolves around Agent Washington, also known as Recovery One, who is a Freelancer like Tex, Wyoming, and York. Washington's job is to recover all Freelancer AI constructs of freelancers killed in action. Reconstruction is the direct sequel to the Blood Gulch Chronicles, exploring the causality of events from both The Blood Gulch Chronicles and Recovery One. It continues to follow Recovery Agent Washington's journey tracking down a mysterious enemy called the Meta, who is killing Freelancers and taking their armor enhancements and AIs. First, Wash has to find the people with the knowledge and experience to help him; the former occupants of Blood Gulch. With Project Freelancer under government investigation, Washington soon begins to realize what Church really is, and the nature of his role in the project. Relocated is a direct sequel to Reconstruction, following the Red Team, now on Valhalla, struggling to do the usual nothing, and Caboose's strange action's at Blue Base drawing further attention to himself. Recreation is a direct sequel to Relocated and Reconstruction. As the Reds continue to try and figure out what Caboose is up to and wake up a comatose Donut, Caboose continues trying to make a new best friend. Caboose decided to head to a desert in search of Tucker, and Sarge and Grif agreed to go with him, unbeknownst to the chaos they are about to get drawn into. Meanwhile, an old enemy pays an unexpected visit to Valhalla. Revelation is a direct sequel to Red vs. Blue Recreation. Washington and the Meta have teamed up to find the missing Epsilon AI, killing most of the Reds in Valhalla, leaving Simmons and Doc prisoner. Sarge and Grif managed to rescue Simmons, and the entire cast follow Caboose and Epsilon to a Freelancer storage facility. There, they meet an old friend, who will spark up a dangerous confrontation between the good, the bad, and the indifferent. "Before there was Red vs. Blue, there was Project Freelancer." Season 9 begins with Epsilon in the storage unit, experiencing similar events in The Blood Gulch Chronicles. Along with this, a new Freelancer back story was also shown, detailing the history of Project Freelancer, namely the events when Tex joins the group. As Epsilon search for Epsilon-Tex in the damaged memory unit, he realizes what the Director and the Alpha couldn't. The two plots are told simultaneously. "The biggest season ever. Of all time." Season 10 continues both plots told in Season 9. The past storyline will show the conclusion of Project Freelancers' quest to defeat a rogue Insurrection group and the lost of complete trust between the Freelancer agents and AIs. The present storyline picks up right where Season 9 left off, as Epsilon-Church joins the Reds and Blues on Agent Carolina's quest for vengeance against the Director of Project Freelancer. Set sometime after Season 10, Season 11 follows Sarge, Grif, and Simmons of Red team and Caboose, Tucker, and Washington of Blue team as they are being transported home after being pardoned for helping bring down Project Freelancer. Unfortunately, the transport crash lands at an unknown location (most likely caused by the combined faults of everyone). Knowing that they'll be stranded for sometime, the Reds and Blues begin building their bases and wait to be rescued. This season takes the series back to its roots: only use the game engine without using CGI. Season 12 continues where the previous left off, with Tucker, Grif, Simmons, and Caboose joining the New Republic, and with help from Rebel leader Vanessa Kimball and mercenary Felix they attempt to rescue Sarge, Donut, Wash and Lopez, who were captured by Locus and the Feds at the end of the previous season. Also in the civil war is Agent Carolina, whose true intentions in the conflict and special interest with a crate remains a mystery. This season also marks the return of CGI in the series, which is blended in with machinima, similar to Revelation. "Their lucky number seven is thirteen." Season 13 is a direct follow-up to Season 12 and the last season of the Chorus Trilogy, in which the Blood Gulch Crew, the New Republic and the Federal Army of Chorus join forces to go to war against Chairman Malcom Hargrove and his space pirates. While this season is the last of the Chorus Trilogy, it doesn't fully conclude the story of many characters, including most members of the Blood Gulch Crew, Locus and the inhabitants of Chorus. This is the first season of the series to be an anthology, presenting a collection of short stories focused on various characters, factions, and events, rather than an episodic storyline. This is also the first season to be written by a combination of both in-house writers and writers residing outside of Rooster Teeth. "A series of violent attacks across human space has people demanding answers. Who are these Reds and Blues? And why are they so bloody ruthless? One reporter sets out to uncover the truth, determined to find out why the once beloved Reds and Blues have turned so malicious, taking her on a galaxy-spanning adventure filled with many twists and turns." Season 15 acted as a follow-up to Season 14, focusing on a reporter who iss searching the reason of why the Reds and Blues have betrayed the galaxy. "The award-winning, longest-running web series Red vs. Blue returns with season 16. Picking up in the moments after the conclusion of season 15, Red vs. Blue returns with a new saga, pitting the characters against powerful new foes and launching them back into an epic adventure unlike any other in the show’s history." The Shisno Paradox is the sixteenth full season of Red vs. Blue, and the first part of a new trilogy of the Reds and Blues' misadventures. Taking place right after the end of Season 15, the story will follow the Reds and Blues in a new adventure that threats the very structure of the universe. Rooster Teeth made numerous PSAs, including for Xbox LIVE's partnership with Rock the Vote in late-summer 2008 and even for the United States Presidential election. These PSAs are usually told from the real-world's point of view, and are obviously done for laughs. Rooster Teeth has done miniseries with the characters previewing Halo 3: ODST, Halo: Reach, and Halo 4. There are two Maxi series, both only available on Halo Waypoint until April 2015, when Rooster Teeth registered a YouTube channel for Red vs. Blue. MIA is a 6-episodes miniseries released to celebrate and promote the launch of Halo: Combat Evolved Anniversary. It was first mentioned in August 2011, during Halo Fest, where the cast had a table read of the series first three episodes' scripts, as well as some improvised comedic lines. The first episode was released on Halo Waypoint in November 2011. The series follow the Reds and Blues as they search for Grif, who is missing, at the same time exploring the multiplayers maps included in the Anniversary Map Pack. Where There's a Will, There's a Wall, shortened "Red vs. Blue: Wall", is a 3-episodes miniseries relating to the Reds attempting to find out what is behind the wall in Hemorrhage, while the Blues receive a Falcon transport as a shipment and what they plan to do with it. The Best of Red vs. Blue Awards, also known as "The Best Red vs. Blue. Ever. Of All Time", is a special video of Red vs. Blue that presents the series' most memorable moments (from Season 1 to Season 9) - as voted by the fans - and is presented in an award show type style. The special also features numerous Red vs. Blue and Grifball miniseries characters. Rooster Teeth stated that they were inspired by Randall Glass' Warthog Jump video, which made them realized that they can create a web series with a video game. The writing process for the series has changed over time. Early in season 1, Burns wrote the episode scripts from week to week, with what appeared to be minimal planning in advance; major plot events seemed to have been conceived shortly before they were filmed. For the second season, Matt Hullum became a main writer. A rough plot outline is now written before a season begins, although the actual content of an individual episode is still decided on a more short-term basis. Shortly after episode 2 was released, Rooster Teeth was contacted by Bungie Studios. To their surprise, Bungie loved the series. A deal was made to allow Rooster Teeth to make the series without licensening fees. However, contradictory to this, Burnie claims that the major plot ideas were decided by episode 6, the episodes just didn't contain much information - they originally went for comedy rather than depth. Because Red vs. Blue is loosely based on the Halo universe, Rooster Teeth encountered some difficulties when trying to synchronize events in the series with the release of Halo 2. Aside from a few scenes created using Marathon: Infinity, Marathon 2, and Halo PC, Red vs. Blue is mostly filmed with interconnected Xbox consoles. As the series title suggests, the original chronicles are largely set in the multiplayer map Blood Gulch and the later series are set in Blood Gulch successors in Halo 2, Halo 3, and Halo: Reach. Within a multiplayer game session, the people controlling the avatars "puppet" their characters, moving them around, firing weapons, and performing other actions as dictated by the script, and in synchronization with the episode's dialogue, which is recorded ahead of time. The "camera" is simply another player, whose first-person perspective is recorded raw to a computer. As the recording occurs within the game, a few different bugs and post-production techniques have been exploited in order to achieve desired visual effects. In particular, Adobe Premiere Pro is used to edit the audio and video together, impose letterboxing to hide the camera player's head-up display, add the titles and fade-to-black screens, and create some visual effects that cannot be accomplished in-game. By Red vs. Blue: Reconstruction, Rooster Teeth has retconned the events in the past five seasons, integrating the plot into the Halo canon, turning Red vs. Blue from a comedy to Halo fan fiction. The key comedy remains in the series, while actions scenes were added into the series. In 2009, Rooster Teeth remastered the first five seasons, removing the traditional HUD camera and combined all episodes into one single video. As of Red vs. Blue: Revelation, Rooster Teeth had hired web-based animator Monty Oum to implement completely animated scenes into the series. The newly animated scenes uses in-game assets from the Halo series and allows much more storytelling possibilities. Red vs. Blue is widely credited with attracting public attention to machinima. Although examples had existed since the 1990s, Clive Thompson, a journalist from New York Times, credits Red vs. Blue as "the first to break out of the underground". In Halo 2, Bungie inserted a special command — a joystick button that makes a soldier lower their weapon — designed solely to make it easier for Rooster Teeth to do dialogue. The series has inspired other machinima productions, including The Codex, Fire Team Charlie, and This Spartan Life. Rooster Teeth's success is recognized by Bungie. The Rooster Teeth crew was featured in the Halo 2 Collector's Edition's Bonus DVD, and the ViDoc O Brave New World. Along with several other exceptional Halo community members, Red vs. Blue was featured in the Halo: Reach Tribute Room easter egg. Red vs. Blue and Rooster Teeth were listed in the "Special Thanks" section of the Halo 3 credits, the Halo 3: ODST credits, and the Halo: Reach credits. Since Bungie's departure from the Halo series, 343 Industries has taken the role of endorsing Rooster Teeth. 343 Industries often hosts Rooster Teeth at events such as Halofest 2011. Halo Waypoint posts multiple Red vs. Blue episodes each week. Rooster Teeth employees were listed in the "Special Thanks" section of the Halo 4 credits. In addition, Rooster Teeth was given the privilege to film the Season 10 finale in Halo 4 multiplayer at 343 Industries a day before the release of Halo 4. On Bungie.net and Halo Waypoint, the Flag Kill medal's description, which is triggered by scrolling over the flag symbol, is "It's right next to the headlight fluid". This is a reference to episodes 3 and 4 of Blood Gulch Chronicles where the new recruit, Donut, is sent on a fool's errand to fetch "headlight fluid" and "elbow grease". Instead, he mistakenly goes to Blue Base and takes their flag. In the Halo 2 multiplayer map Beaver Creek, a faint message reading "Why Am I Here" can be seen on the wall, referencing the first line in Red vs. Blue. In Halo 3, the Password-Lacking Marine involves a Marine and a voice behind a door arguing. Not only are the duo voiced by the Rooster Teeth crew, their arguments also make reference to Red vs. Blue lines. In Halo 3, Halo 3: ODST, and Halo: Reach, the Warthog's tires are printed with the word "PUMA". This is a reference to the second episode of Red vs. Blue, in which Grif commented that the Red Team's Warthog resembles a Puma rather than a Warthog. In the Halo: Reach radio conversation on Holdout, two characters can be heard discussing their "zombie plans," referencing the Red vs. Blue PSA Planning to Fail. One of the ODSTs notes that their Sangheili prisoner Jul ‘Mdama sounds like he is saying "Blarg". This is a reference to the Sangheili, referred to as "aliens", in Red vs. Blue only saying "Blarg" and "Honk". The AI Black Box calls Evan Phillips "Phyllis", which was the original name of the Blue Team's tank's AI, Sheila. When Red team tricks someone and steals something by surprise, they would say "Yoink!" This was made into the Yoink medal in Halo: Reach. Whenever someone is performing an assassination and their target dies before the animation finished, that player gets the medal "Yoink!" One of Halo 4's Achievements is called "I <3 Red vs Blue", which can be obtained by winning 5 War Games. Another Achievement, Roses vs Violets can be obtained by finding an easter egg of the series during Spartan Ops. When the player shoots to a hidden box in a lava stream in Episode 1 Chapter 5 and get the achievement Roses vs Violets, Michael J. Caboose of Blue Team will slip in the radio transmissions between Sarah Palmer, Robert Dalton and Fireteam Castle. If the player shoot to a hidden box in Episode 2 Chapter 5, four characters (Church, Caboose, Grif and Simmons) can be heard in Audio Logs inside the facility, replacing Science Team Gagarin. If the player shoots a hidden box in Episode 3 Chapter 4, Simmons and Grif of Red Team can be heard as two pilots of the Mantis-carrying Pelicans. If the player shoots a hidden box in Episode 4 Chapter 2, Vic can be heard flirting with Palmer. If the player shoots a hidden box in Episode 5 Chapter 5, Sarge and Grif can be heard arguing over a Pelican which apparently carries cargo for Grifball (The subtitles mistakenly identify them as Caboose and Sarge). If the player shoots a hidden box in Episode 6 Chapter 4, when Fireteam Switchback contacts the UNSC Infinity, instead of SPARTAN Cara Costabile, Sarge (posing as a "Corporal Switchback") will be heared asking Infinity if their slipspace drive is running, followed by the usual punchline of "Better go catch it!". A few seconds later Grif can be heard screaming "Baba-Booey!! Baba-Booey!!". If the player shoots a hidden box in Episode 7 Chapter 3, when Crimson is fighting against Jul 'Mdama's Covenant, Simmons will contact Command, saying there's a firefight in the engine room and he needs Maintenance. Miller answers him that the Spartans will be there soon, to which Simmons responds sarcastically: "Oh great! More people with guns. I'm sure THAT will fix the engine." If the player shoots a hidden box in Episode 8 Chapter 2, after Miller tells Crimson that Dalton is sending more gear, Caboose will say "Six crates of elbow grease and headlight fluid inbound now!". If the player shoots a hidden box in Episode 9 Chapter 5, when Crimson activates one of Hawk Squad's IFF tags, Church will be heared discuss with a Sangheili, telling him that he does not understand what he says. The Elite, enraged, kills Church with an Energy Sword. This easter egg is a reference to the first chapters of Red vs Blue Season 4, where the Blue Team meets an alien and they have trouble understanding what the alien is saying. If the player shoots a hidden box in Episode 10 Chapter 3, when Crimson must aboard a Lich with jetpacks, Freelancer Agent Georgia will say "Cool, jetpacks! That'll help us get on that ship or my name isn't Agent Georgia". This easter is a reference to a running gag in Season 10, in which Agent Georgia was involved in a terrible incident, due to not following "course correction" while using a jetpack and his body was never found. At the same time, that reference is heavily reminiscent of James-005's fate. One of Halo: The Master Chief Collection' achievements, specifically for Halo 2: Anniversary is called "Six Pedals, Four Directions", making reference to a recurrent gag in the show. In Halo 5: Guardians, the description for the HCS Contender Red weapon skins reads "Let's all take dying as an open action item." This is a quote from the Season 2 finale, "K.I.T. B.F.F.". Most of the character names can be found in Halo: Combat Evolved's Temporary Profile feature. Out of the randomly generated names, Caboose, Church, Donut, Simmons, and Doc are commonly found. It is possible Rooster Teeth named their characters using this feature. This feature is continued in Halo 3, with names like Caboose and Donut showing up as temporary profiles. In episode 100 of The Blood Gulch Chronicles, when Tex takes off in the Pelican, the word "Marathon" is partially obscured on the underside. This is an obvious reference to Bungie's previous game series, Marathon, in appreciation from Rooster Teeth. Red vs. Blue paid homage to Bungie's love for seven. Some examples include Sister stating that she was close to having seven abortions, the Red Zealot from Battle Creek claiming that Caboose is the one who will "rule [them] for seven years", and the Meta capturing seven artificial intelligence fragments in total. In the Red vs. Blue: ODST episodes Church says that he heard a rumor that Avery Junior Johnson can't be killed. This is an obvious reference to how in the games he is a plot critical character and is invincible. In Revelation Chapter 2, Sarge remarked that the "[pistols] aren’t effective as they used to be." This is a reference to how the M6 series lost its effectiveness drastically between Halo: Combat Evolved and Halo 3. In Revelation Chapter 20, a UNSC interrogator stated that "the budget only allows for one crashed Pelican per mission." This is a reference to the fact that every level (mission) in Halo 3 has at least one crashed Pelican (with the exception of Crow's Nest). All of the Freelancers were stripped of their real names and were given codenames based on the 50 US states, similar to the SPARTAN-IIs; with the only difference being that the SPARTANS kept their first names. As well, they each had a number system similar to the Spartans, though the only confirmed example is New York; F-12 (Foxtrot-12), with "F" for Freelancer instead of "S" for Spartan or Sierra. Another similarity between the SPARTANs and Freelancers is that the Freelancers were trained to fight the Insurrection, in almost the exact same way as the SPARTANs. In several episodes of Season 9, several Huragok symbols are seen in an object called the Sarcophagus, which is revealed in the Season 10 Episode 16 that the Sarcophagus contains a Huragok, which was an important factor in the creation of the Freelancer AIs. In Season 11 Episode 4, two scenarios of the obstacle course that Tucker runs are campaigns levels of Halo: Combat Evolved and Halo 4, these being "The Maw" and "Reclaimer", respectively. During Season 12, Locus thinks that soldiers and humans are two different things, making a reference to John-117' statement in Halo 4's Epilogue. Season 15 synopsis is extremely similar to the premise narrated by the first season of Hunt the Truth. In Season 15 Episode 11, Tucker is shown playing the level "A New Enemy" from Halo Wars 2. 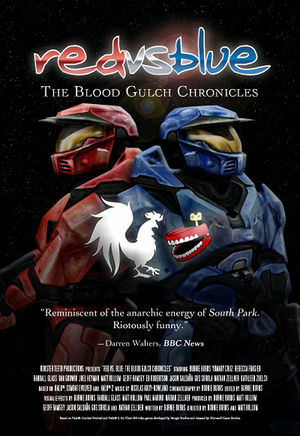 Red vs. Blue, was originally intended to last only six installments, but its popularity led to the production of 100 episodes of The Blood Gulch Chronicles, and another eight seasons. The popular Double EXP Weekend game type "Grifball" is based off of Sarge's line from episode 59 of Red vs. Blue. The DVD cover of Season One. The DVD cover of Season Two. The DVD cover of Season Three. The DVD cover of Season Four. The DVD cover of Season Five. The Blood Gulch Chronicles Remastered DVD boxset. Red vs. Blue: Reconstruction DVD Case. Red vs. Blue: Revelation DVD cover. Red vs. Blue: Season 9 DVD Cover. Red vs. Blue: Season 10's not final DVD cover. Red vs. Blue Season 10's Official DVD/Blu-ray cover. 10 Years of Red vs. Blue DVD/Blu-ray cover. Red vs. Blue Season 11's Official DVD/Blu-ray cover. Red vs. Blue Season 12's Official DVD/Blu-ray cover. Red vs. Blue Season 13's Official DVD/Blu-ray cover. Red vs. Blue Season 14's Official DVD/Blu-ray cover. Red vs. Blue Season 15's Official DVD/Blu-ray cover.